How to use shine as a design element – Color and form are important elements that one should consider in design. But the surface textures might be as important to your final product as other aspects of your design choices. This example of a vacation home was sold sight unseen from the pictures provided. The buyer fell in love with this cheery remodel home even before setting foot in the house. 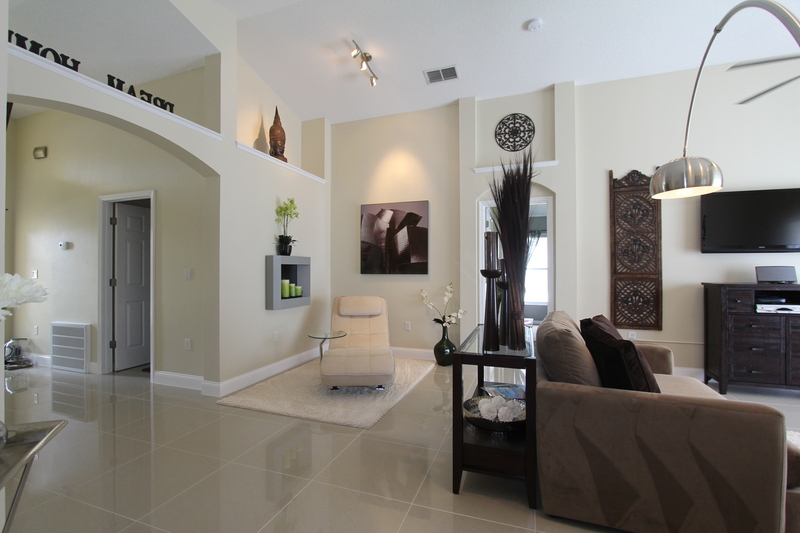 Instead of the typical choice of carpet or wood floor the Orlando interior designer Helen Bonello-Strauss took high gloss porcelain tile as the floor covering to give this house some style. With 1400 sq ft this house is not the biggest in the neighborhood. So the fit and finishes had to make a lasting impact. While the bedrooms received a frieze carpet for a warm textured look, the living area, kitchen, and wet areas show a large 20″ tile with white high gloss finish. The spaces flow seamless and the contractor was able to lay the tiles in all the traffic areas without interruption or change in pattern so that no threshold would interrupt the flow. The grout lines in a matching white were tiny with 1/16 of an inch and almost disappear. The reflective surface makes the light bounces of and gives you some mirrored effect, opening the space and offering a clean fresh look. The maintenance aspect of this floor is undeniable. Easy to wipe down and hard wearing, these floors are deemed to last. The house quickly found its use as a vacation home, that is rented out during the time the owners don’t have use for it. The durable floor itself helps to curb maintenance efforts and cost. The contemporary style with the oversized comfortable furnishings deliver the promise of a relaxing time in stylish surroundings. Who would not want to stay in such a place? You want your house to shine in all it glory? You may want to consider a smooth move. Even if it means for you subscribe to a high gloss lifestyle. See the staging transformation of a newer home in Deland Florida – This property located in the nice and quaint college town Deland Florida left not much to wish for. The spacious home boasts over 2800 sq ft of living area under air and heat. There are formal living and dining room, the kitchen that opens to family room and a matter suite on the first floor. The second floor has three bedrooms and a large open loft area. All spaces were quite nice sized and renovated, but the empty house did not offer much that makes a buyer remember it. It was priced very competitively well below some other comparable sales and remained unsold for three months. Interior designer and decorator Helene Bonello-Strauss came in to give this listing a competitive edge. Her first order of business was to convince the owner to replace the carpet in the formal living area with a nice dark laminate floor. She also recommended to add a French door refrigerator to the kitchen. These changes already make a difference with many buyers. Especially young families are cash strapped with the cost related to their real estate purchase. An expensive refrigerator included in the transaction saves the buyer cash funds as they are able to roll the extra price into the financing. 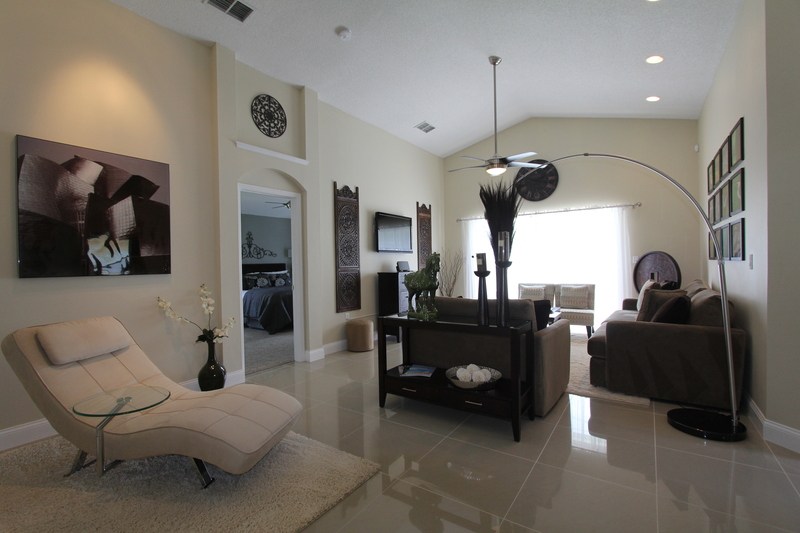 The staging created a tremendous change in the property. The combined formal living and dining now looks stylish and up to date and provides clear defined areas to socialize with guests or to have a meal together. Although the room received a new wood floor, Helene used area rugs to give the different spaces some separation and anchor the furniture as vignettes. The family room of the kitchen got fitted with a comfortable brown leather sectional. The material and color suggests a comfortable and durable spot for the whole family to hang out. “The loft area is the selling point”, so stager Helene Bonello-Strauss. She imagined the most likely buyer for this house to be a family with children. The open flex space upstairs should be a living and play area dedicated to the children and their friends. So the designer fit the room with a TV area where some oversized chairs invite visitors to kick back and watch a favorite movie or game. The ottomans function as a chaise or offer additional seating when needed. In addition there is a desk space that allows the kids to do homework or explore their creative side with arts and crafts. The air hockey games table is the eye catching wow factor for the youngsters in the purchasing party. The designer finds it important to cater also to the children when designing a house. Yes, the adults are the ones who make the ultimate buying decision, but if the kids fall in love with the house the chances of a sale are exponentially larger. The association of realtor’s identify school location and additional space requirement for the children two of the main motivators for a move. This loft area is designed to be a hit with the younger crowd and offers so many uses with different seating, play and entertainment options. Hey, who knows – dad might want to occupy the space with his friend for some weekend sport watching. One thing is for sure: this transformation is deemed to be a hit for the whole family. We keep our fingers crossed and will report back once the property went under contract. If you know someone interested in a house in that area have them contact their Realtor. The address of that property is 720 Gordonia Ct, Deland FL 32724. See what some interiors will do to a Deltona home – The newly renovated home needed something extra to make it stand out. The listing agent Cherie Price with Re/Max Central Realty had seen other properties that were transformed by the interior designer Helene Bonello-Strauss. Cherie Price wanted that feel of luxury and a comfortable atmosphere in the home, so she hired www.idesigntosell.com to assist with a temporary staging transformation. The four bedroom home received a staging in the living areas and two of the four bedrooms. The window treatments and area rugs helped a lot to add texture and warmth to the empty space. The living area had all tiles. That made the empty room look a bit cold and uninviting. While many other stagers do not add curtains or area rugs, Helene felt that those were essential to the success of the transformation. “Especially with large tiled rooms you want fabrics in there to overcome that ocean of hard surfaces”. Area rugs help to anchor the furniture and improve the acoustics in a room. The window treatments also help to soften the room and add visual interest and height to the design. This Deltona home is available for sale at a very reasonable price. Anyone interested please call the listing agent Cherie Price at 386-956-0006 or contact your local Realtor (R). 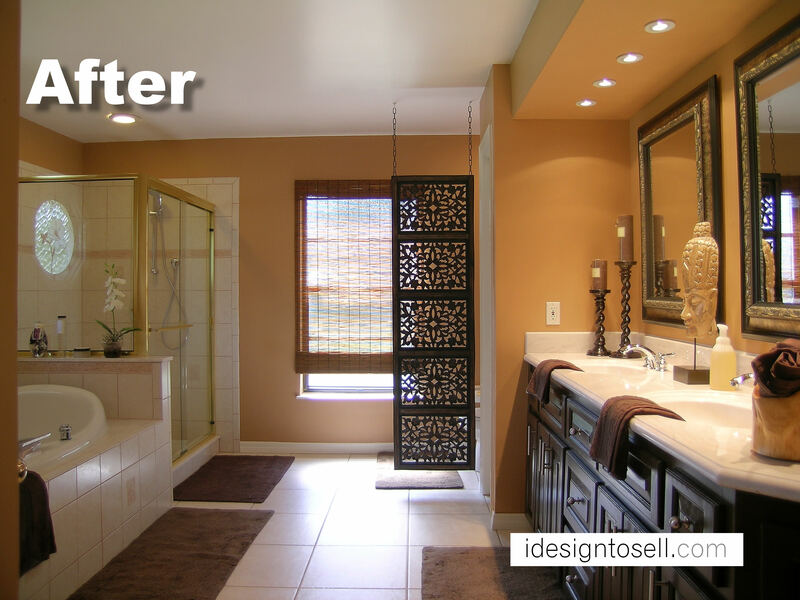 Tip: Refresh your bathroom without major renovation. Kitchen and bathroom renovations add the most value to your house but typically are also quite costly. Some times the basics are still in a good condition so that some smaller cosmetic changes can make a big difference. 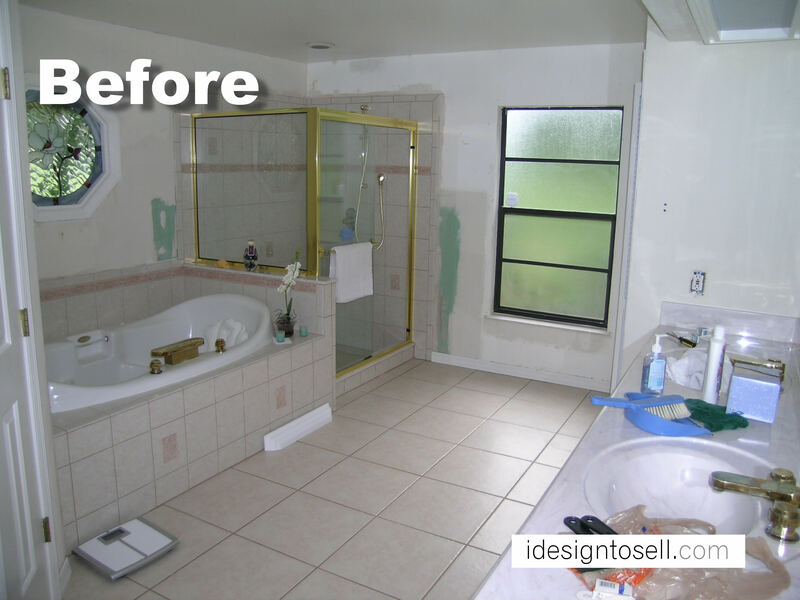 This master bath had dated flower wallpaper that was already removed in the “before” picture. The oak cabinetry showed wear and tear and the vanity has some florescent lights overhead that created a harsh lighting over the counters. The Orlando interior designer Helene Bonello-Strauss opted for a cosmetic overhaul that cost little money but gave the room a big impact. The walls were painted in a warm terra cotta color. The tiles, tub and shower were in good shape and did not need changing. Only the vanity received some new faucets to replace the corroded old ones. The vanity cabinets were refinished in a black brown satin finish. The paint color name “Starry Night” which gave us a very rich dark brown. Perfect to hide imperfections. The commode was in the back right corner without real privacy. Helene used a carved screen to give that area some additional separation and visual interest. Since curtains in bathrooms are impractical this is a good way to add texture without adding opportunity for mold. The fluorescent lights were closed up and replaced with some 4 ” halogen pot lights over the sinks. They provide a nice warm glow. Alternatively one can use LED fixtures that come in various sizes and wattage without the added heat output of halogen. This bathroom now presents itself in a total different way. From outdated to fabulous in a little more than a weekend on a tight budget. What more can the homeowner ask for. Would this had been a gut renovation this bathroom remodel would have cost $ 5000 at a minimum and could go into the tens of thousands if the fixtures were real exclusive and elaborate. Good design does not have to cost a fortune to look great. Sometimes all it takes are some good ideas and elbow grease. Orlando Bungalow sold after redesign – This 1920’s bungalow sold after a complete rehab. The transformation took a full year after a few setbacks and changes in the architectural plans. The old garage/workshop was transformed into a guesthouse and the main house underwent a full transformation. The staging was set up to show the elegant side of this charming home and give the property some sophistication to attract the younger city dwellers. With a 3 bedroom and 2 full baths in the main house and a self contained guest house with its own bath and kitchen facilities, this house would cater to a family as much as to a couple or a single person. The Orlando interior designer Helene Bonello-Strauss wanted to make sure she has the property set up to speak to a large audience. A house, that is close to a hundred years old, was in itself something special in the central Florida market. With that age it had to show its modern side while maintaining an architectural integrity that would fit a traditional bungalow. The kitchen and bathrooms were gut remodeled and received all new fixtures. While giving the house up to date functionality it was important to the Designer to maintain some classical design elements and materials. The tile are mostly classic white marble with a band of mosaic in the middle of the tub surround. The tub is a freestanding tub with simplified lines that reminds one of the claw foot tub of yesterday. Here Helene wanted to keep a similar form while updating it at the same time. The master received a walk in shower with glass enclosure and a modern multi-jet fixture. The wall tile are also the white marble accented with black glass mosaic inlay. The vanity in the master has quite a traditional appeal with traditional woodwork and a marble sink. New fixtures can be updated but show a homage to traditions at the same time. It is a designers tightrope walk that will be risky. No one wants to spend a small fortune to end up with a dated design. At the same time it may be a mistake to bring in design elements that are in contrast with the architectural integrity of the structure. The ideal solution is to enhance the architecture and take design elements from that same style and era and fuse them to a new identity. If the viewer has the feeling that the design solution is one that was meant to be for the house, the quest was successful. It is not always easy to bring the past into the presence and create something that looks authentic and intentional. Sometimes it needs a bit of imagination and the willingness to look back. In design there is no one-size-fits-all. Good interior design is not only the task of designing for a client or a target audience, but also designing for a specific style. Speaking the same design language as the architect who drew up the plans decades ago, while rejuvenating the appeal can create tremendous value in the eye of the potential purchaser. Don’t hide the style of the house. Take it in and embrace it for a great result. Let the house show its heritage with pride. There is a story hidden in those walls. Listen to the whisper of past decades and bring your version of that story to the surface. You will find that in re-imagining the story of an old house you will uncover many facets of yourself.